Excel Consultant Completes 400th project with Staples! Most business owners have heard of the business supplies store, Staples. Staples is one of a handful of very similar stores. Office this, Office that, etc. Staples is the leading company in this space, an their success can be attributed to their ability to know what the costumers want. Office products from paper, photo copies, calculators to computers and cell phones, Staples has all of the office supplies your business needs. One of the nice things about working with Staples is that they are an utter joy to work with. I do not know if it is Georgia, something in the water, or training at Staples, but something has them customer faced. Well done. There are milestones in life and there are milestones in business. Personal milestones may be turning 16, 18, 21, etc. Business milestones may be ten years in business, 25 years in business, 5,000 projects completed, 1,000,000 in sales, or in our case, the completion of 400 advanced Microsoft Office programming projects completed with Staples. Some of these milestones are more meaningful than others, yet American culture if you will, places importance on milestones and completions. When milestones are reached, businesses often make social media announcements. Such as this post on how happy we are to announce the completion of our 400th project with Staples. 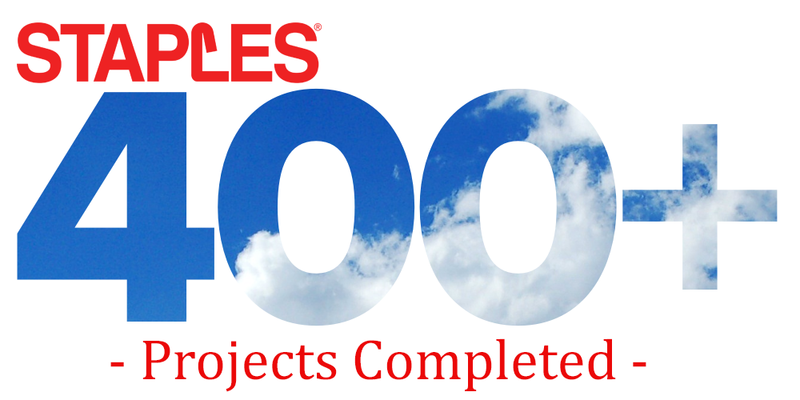 Excel and Access, LLC completes 400th project with Staples. The importance of this milestone, completion of the 400th project for a particular client is worth noting. It shows you something, you can have a long-term client/vendor relationship with clients that designate your company as their vendor. So let’s say in terms of Microsoft Office programming, you may work with the client such as Staples for years or even decades, on dozens of projects. This is the perfect client/consultant relationship; the entire process becomes more efficient over time, as projects are completed. Having done the same process, over and over, develop Microsoft Excel, Word, etc., applications based on specs provided. The client sends the file and the statement of work. The developer does the work and returns the file. Tweaks are made as needed. Works like clockwork. Find a developer, vet them, use them on all of your projects. The optimal way to outsource work to local consultants. Posted on February 23, 2018 Posted in Blog Category and tagged Programming, Microsoft.